Should Children With a Low Grade Fever Be Kept Home from School? A low-grade fever is any temperature between 98.7 degrees Fahrenheit and 100.4 degrees. Because the body's temperature varies with activity and many children have higher-than-average normal temperatures, most pediatricians don't consider temperatures below 100 degrees dangerous. Because infections can easily spread between children and kids may become sicker if overexerted, it's generally a good idea to exercise caution when deciding whether to keep your child home. Children's temperatures are normally lowest when they first wake up. If your child has an elevated temperature first thing in the morning, it may rise throughout the day. Conversely, a child's temperature may be elevated due to strenuous activity. 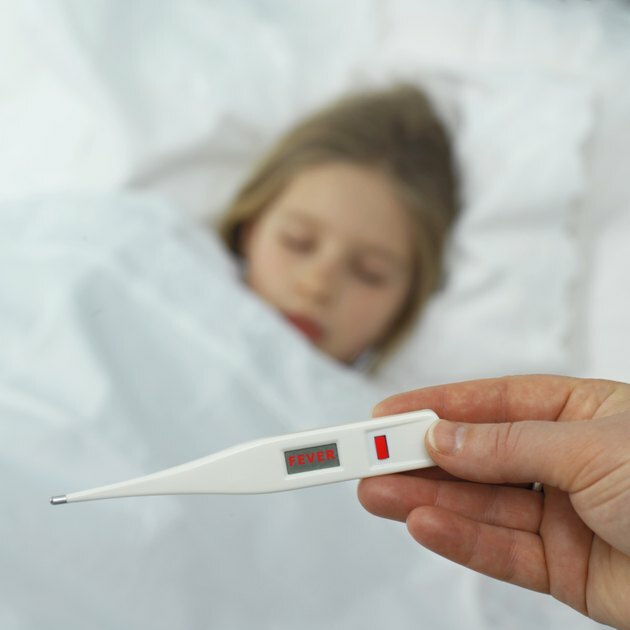 It's a good idea to know your child's average body temperature when she's not sick so you can judge whether a low-grade fever is really a fever or your child's normal temperature. A fever is the body's way of fighting an infection. Elevated temperatures kill some bacteria and viruses. They also activate the body's white blood cells and inflammatory response, both of which kill infections. Sometimes children have fevers with no other symptoms when they're fighting off minor infections. Cuts, minor sinus infections and tooth abscesses can all cause fevers. Check your child's other symptoms to determine whether or not to keep her home from school. A child with a stuffy nose or a cough, or who is vomiting, may have an illness that will get worse with strenuous exertion. If your child has recently had dental work, however, she may develop a low-grade fever, according to pediatrician William Sears. These fevers do not necessarily indicate an infection, but you should consult your child's pediatrician to be sure. In general, even a low-grade fever indicates a contagious infection. Illnesses are the most contagious in the first two or three days. If your child has just gotten sick, keep her home. Children should also stay home if they exhibit any other symptoms or if their lymph nodes are swollen. If you're not sure, encourage your child to rest and then take her temperature again an hour later to see if it has gone up or down. What Is Causing My Toddler's Low Body Temperature? Can a Child Swim With a Fever? What Happens When You Go to the Gym When You Are Sick?